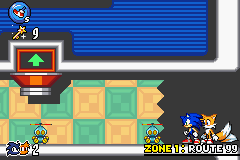 The Sonic Factory is a location in Sonic Advance 3 accessible from any Zone Map via a large ring. This place serves as the player's central hub and offers a number of services. The ground floor has the entrance at the lower right corner, in which exiting that way will take the player back to the Zone Map they came from. To the left of it is a pipe that will allow the player to change their characters. A Spring to the left gives the player access to two more facilities on the next floor. By going left on the second floor, the player will find the Chao Playground, where they can see all the Chao they have found in the Zones and review a checklist by pressing . Going right will take the player to a level select where they can jump into a port and travel to any Zone they have reached. Said ports are only activated once the player has unlocked its respective Zone. Whilst in the Sonic Factory, the player is unable to perform any Tag Actions. However, they could do so in the EU prototype. This page was last edited on 5 January 2019, at 13:37.